The Sphere, a photo by Thomas Gehrke on Flickr. 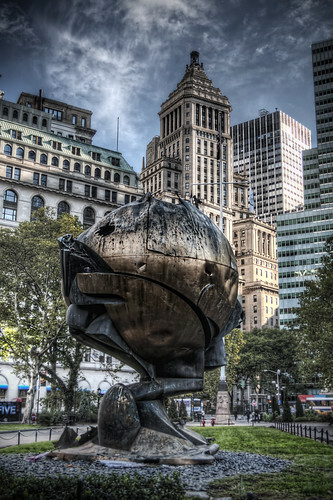 The Sphere is a large metallic sculpture by German sculptor Fritz Koenig, currently displayed in Battery Park, New York City, that once stood in the middle of Austin J. Tobin Plaza, the area between the World Trade Center towers in Manhattan. After being recovered from the rubble of the Twin Towers after the September 11, 2001, attacks, the artwork faced an uncertain fate, and it was dismantled into its components. Although it remained structurally intact, it had been visibly damaged by debris from the airliners that were crashed into the buildings and from the collapsing skyscrapers themselves. Six months after the attacks, following a documentary film about the sculpture, it was relocated to Battery Park on a temporary basis—without any repairs—and formally rededicated with an eternal flame as a memorial to the victims of 9/11. It has become a major tourist attraction, due partly to the fact that it survived the attacks with only dents and holes. Three exposure handheld HDR. Started in Lightroom, tonemapped in Photomatix Pro and finished off in Photoshop.